Welcome! VERE provides lobbying for small and medium sized enterprises regarding environmental laws in Europe and transfers the issues into the political debate. VERE's "take-e-way" service for WEEE, battery and packaging compliance allows our members to focus on their core competencies and their business. VERE is connected with ministries, authorities, political organizations and has a broad partner network. 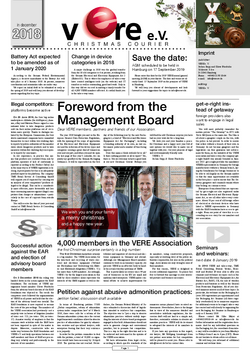 The VERE Association for the take-back and recycling of waste electrical and electronic equipment (VERE e.V. registered association) is an international EEE respectively WEEE community for the optimal organization and management of all environmental laws arising from the obligations and consequences for manufacturers, importers and distributors of electrical and electronic equipment. The VERE Association especially cares for small and medium-sized enterprises (SMEs), micro-enterprises and sole proprietorships and preserves its interests. Thus, VERE fills a niche in the sector of electrical and electronic devices. The VERE Association provides lobbying while constantly maintaining its political neutrality. As a guardian for small and medium-sized enterprises VERE attends to the problems, concerns and grievances of its members and transfers the issues into the political debate.